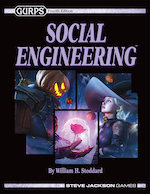 The ENnie Award nomination for GURPS Social Engineering was a delight I hadn't anticipated. I'm pleased, not just on my own behalf and that of Steve Jackson Games (whose support for this project deserves this kind of recognition), but at seeing the gaming community recognizing a book with this special focus. For many years now, my own campaigns have put a lot of weight on characterization, relationships, and dialogue – on the roleplaying part of "RPG." Some of them have focused on pursuing goals through social activities, such as trade, diplomacy, or investigation. In a few, the main goals have been social, such as courtship, social position, or political change. Experience in running these went into GURPS Social Engineering. As Sean Punch pointed out, the nomination shows that gaming in general has room for these themes. And perhaps this recognition will encourage more gamers to explore their possibilities. Aside from my personal tastes – and being pleased to have them shared! – I think this is good for my favorite hobby, for two reasons. For people who are already involved in RPGs, roleplaying social interaction can make for a richer game. It gives their characters a bigger toolkit for accomplishing their goals, and a wider choice of roles in a team effort. Perhaps even more important, this kind of roleplaying helps bring characters more fully to life. Isn't that the real payoff of RPGs for many people – to play a role vividly and memorably? But also, by including a wider range of activities and goals, RPGs can attract more diverse players with a wider range of interests. And bringing in these new players will add to the creative mix of the hobby. I hope that I've helped open the door to more new players with this book, as I've tried to do personally in my own campaigns. I also am tremendously pleased to see GURPS Horror receiving three nominations. I consider this the best genre book I've ever seen – not only the most useful, but the most enlightening and thought-provoking; it's a model for me of what I want to accomplish. I hope that Kenneth Hite gets the recognition he deserves for his work on it! Voting ends on Sunday, July 29th, so don't forget to cast your vote for your favorite games, companies, and supplements.